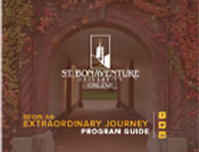 What are the admissions requirements for St. Bonaventure University Online graduate programs? How are courses delivered at St. Bonaventure University Online? All online courses are taught using the Moodle Learning Management System. Your professors will use Moodle to post lecture content, facilitate class discussions, distribute assignments and more. All courses can be completed 100% online, and you attend at your convenience and around what fits with your schedule. Students enrolled in the Cybersecurity, IMC, MBA and MSL programs are not required to ever be on campus. Students enrolled in the Clinical Mental Health Counseling and School Counseling programs are required to attend two 4-day residency sessions as a part of their curriculum. Please contact us for more information on those residencies. What support do you offer online students? We know that as an online student you may be working on coursework anytime and anyplace. Our 24x7 Help Center is always available to assist you with any technical questions you may have via a help desk ticket submitted here. Or can be reached via phone Monday- Friday from 9:00am-9:00pm (EST) at 888-998-6010. Upon enrollment, you are partnered with your very own Student Success Coach who walks alongside you to make sure you have the tools, information and resources you need to succeed. For more specific information, please see our Student Services and Support page. Our team of reference librarians is ready to assist you with all of your reference needs. For more information, visit our library guide for graduate online learners. What is the cost of a St. Bonaventure University Online Graduate Education? Payment for Graduate level courses are due before each course begins. Billing will be sent out with a specific due date; however; deferments are permitted for courses starting at a later date. Because of the Federal Guidelines for the Direct Student Loan Program, you may be billed in August or December for the entire fall or spring semester. This is to permit processing and disbursement of loan funds. Graduate level financial aid is based in part on financial need. In order for SBU to determine your need, you must complete the FAFSA (the same process you may have experienced for undergraduate financial aid). The Federal code number for St. Bonaventure is 00281. Your online Enrollment Advisor will walk you through the process of applying for financial aid. How many starts are available for online programs?